While exploring an ancient wreck, the Panarea III, at a depth of 400ft in the Tyrrhenian Sea off the Aeolian island of Panarea north of Sicily, divers from the Florida-based non-profit Global Underwater Explorers (GUE) found a 2,000 year old altar used for sacrifice to the gods during the Ancient Roman era. Jarrod Jablonski, president of GUE, said the find was a “remarkable piece of history”, exhibiting intricate wave patterns and Greek letters inscribed into its surface. Sixteen other unique artifacts were recovered by GUE technical divers working closely with submersibles from Brownie’s Global Logistics. The Sicilian government will study and preserve these artifacts. "This shipwreck is a very important occasion to understand more about the daily life on the ancient ship, as well as the real dynamics of ancient trade," said Sebastiano Tusa, superintendent of Maritime Cultural Heritage of Sicily and professor of prehistory at the Suor Orsola Benincasa. "Of course, there are other similar shipwrecks that can offer similar study cases. But this has the peculiarity to be in a very good preservation condition." 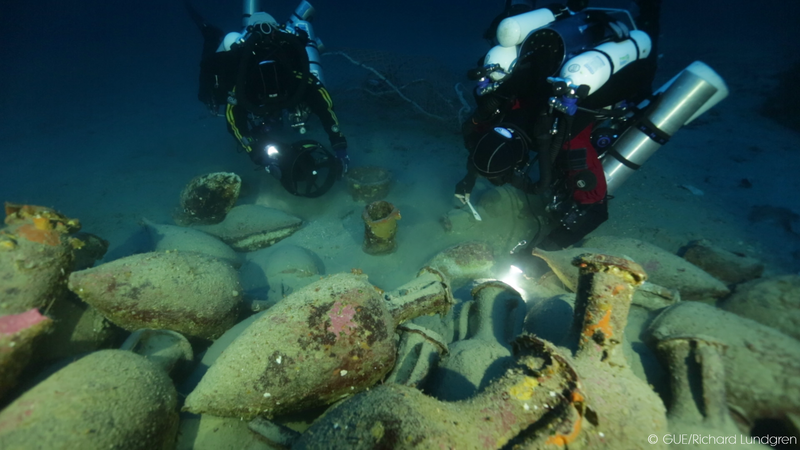 The recovery was conducted as part of Project Baseline, a non-profit initiative in which volunteer technical divers document important underwater cultural and environmental resources around the world. It is very likely to be the deepest archaeology done by skilled volunteer divers. GUE divers, Jablonski, Mario Arena and Richard Lundgren were supported by John Kendall, Gideon Liew and Ingemar Lundgren in the recovery of the ancient alter.